Here's my preliminary concept for the campaign; in this bloody time of civil war, a dying warlord has a battlefield vision of the Sun warning him that blood will continue to soak the soil of the provinces until the sword of the last shogun, lost for a hundred years, is rediscovered; she promises that her brother, the Moon, will reveal the secret to a worthy champion who solves the riddle of the lost sword; the answer lies on Spirit Island. As rumors of this unearthly vision spread around the countryside, many of the lords and daimyos scoff at the fanciful tale and continue to build their power and maneuver their forces for war. But there are sentimentalists that send agents to the coast to secure passage to mist-shrouded Spirit Island seeking answers. Spirit Island is rugged and has little arable land; the indigent people are gaijin or barbarians who live by fishing and hunting. Tradition holds that in the distant past, powerful shrines to the kami and the elements once existed there, but the locations of these secret places are now lost to memory. In this way, adventurers that explore Spirit Island might discover 5 hidden dungeons (and/or shrines and temples) each themed after an element - wood, fire, water, earth, and metal; the island is inhabited by a mix of hostile native folks and peaceful nature spirits, priests, holy sites, angry kami, duplicitous demons, vengeful ghosts, rival adventurers, spies, and bandits. In terms of campaign play, characters that manage to explore the 5 sites would be in the mid-levels (levels 5-6), just in time for the domain play and mass combat on the mainland to become super interesting and relevant to them. DM Notes - a defense and explanation of some of these ideas. Putting most of the early adventuring on an island helps limit the initial creation scope; there's the coastal town or city to create as a home base, some indigenous settlements on the island, and then the wilds and dungeons themselves. Another reason for starting with the D&D style play up front - exploration, puzzle solving, crawling ruins, fighting monsters, and so on - allows me to ease in the 'feudal Japan' cultural stuff, which helps limit info dumps and gives players time to adjust to the culture - including the DM! Feudal Japan is like an alien planet to a western gamer, and this type of campaign risks becoming a "sword & planet" game because the setting is so removed from our regular experience… too much, 'No no no, your character wouldn't do that in this culture...', so introducing the cultural details over an extended period makes a lot of sense to me. Heck, that reminds me - I sat in on a history seminar at Gencon that discussed these issues quite a bit, and I took a lot of notes - it warrants a post. The politics and clans of the main islands of the country will be loosely adapted from historical sources. By the time characters are in the mid-levels, they have reputations and are able to do the things that distinguish the Japan-inspired setting - courtly intrigue, battlefield command, duels of honor, service to a powerful lord. Plus all the things you expect in a samurai-themed game that you see in the movies… iaijutsu showdowns, one-against-many, flashing katanas, the struggle between duty and obligation and choosing sides. Readers here have been super supportive and helpful with these brainstorming sessions - it's much appreciated! If I could be so bold to ask, where is a good location for "Spirit Island" and what might make a good departure port for characters wishing to sail there? I had considered making it the main section of Hokkaido island, or something further north in the chain. I'm sure ideas will lend themselves to me as I get more period reading under my belt. While Hokkaido or one of the northern islands seems to fit the bill as remote, mountainous, forested, misty, and populated with potentially hostile indigenous people, there's an appeal to placing the island a bit closer to the political action, too. It may be a few weeks before I have anything next; I'm reading Sengoku and Bushido, as well as the Turnbull book, and starting to watch Moribito (really great so far!) I can see that I should track down a book of folklore or fairy tales that has ghost stories and tales of spirits so I can develop a sizeable alternative bestiary for the island. I'll keep making notes and let these ideas simmer and percolate in the back of my head; many of my best ideas come after I set things down and return to them. This is a great project for whenever I get writer's block or burnout on the Black City. What do you think of 'Secrets of Spirit Island' as the name of the campaign? *The picture is an example of a misty Shinto shrine on a mountain top, the kinds I envision hidden away all over Spirit Island. The owner retains all copyrights in the picture. That sounds like a great title--and great inspirations there, too. I'm loving it, Beedo. I think your choices regarding the world setting, the spirit island and the eventual, natural shift from low to mid-level play are inspired ones from a gaming standpoint. Some campaign ideas strike you with their originality. Others maybe just a tone or locale that hits a sweet spot for you. Still others strike you with what appears to be their inherent playability or elegance... that is, the ease with which you could play in or run it for a long time. You're hitting at least two of those three for me. I haven't been this interested in seeing how an alternate setting turns out since I started reading about weird Adventures on Trey's blog. The peak of Mount Waiʻaleʻale is perpetually enshrouded by clouds and is (arguably) the wettest spot on Earth. 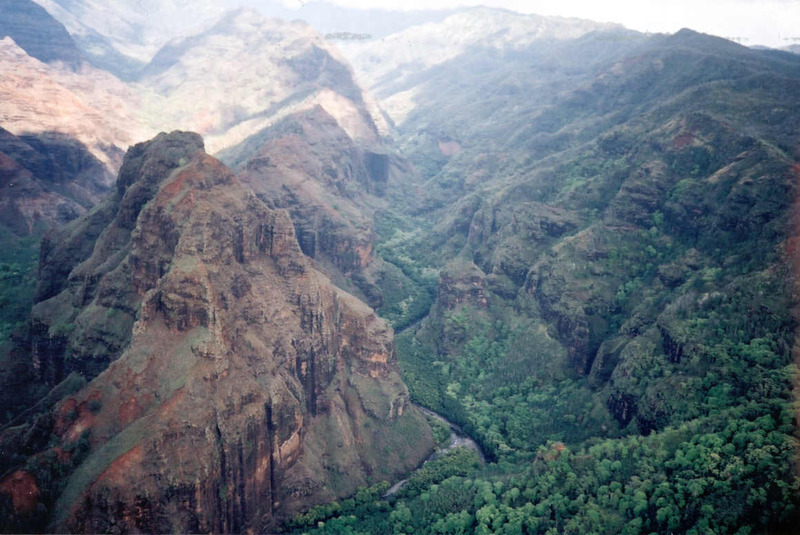 Has the 10 mile long Waimea Canyon, formed by the catastrophic collapse of the volcano's lava chamber. 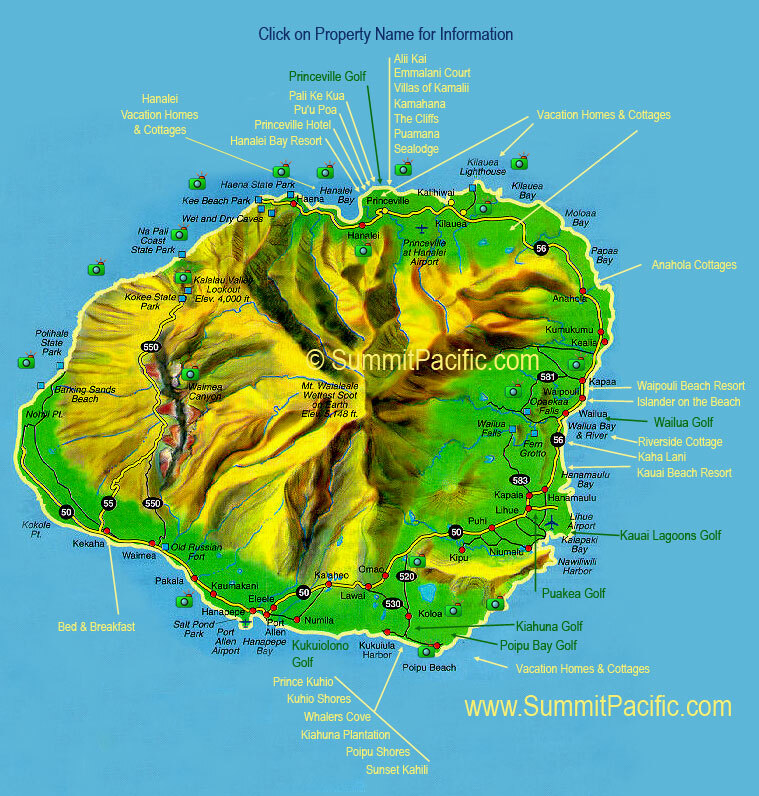 Has lots of easily accessible flat lands surrounding a mountainous center. Some of the cliffs are incredibly rugged. Treacherous trails:"Lucky for him, his head smashed into a rock and arrested his fall. The impact separated his nostrils from his face, but he survived." I've heard stories about hikers getting lost on the plateau, and heading for the sound of the ocean. The vegetation is so dense that they don't realize they're walking up to a cliff. They fall through accumulated debris, down to the water below, where the waves shred their bodies against the rocks. Then sharks eat the shreds. Perhaps apocryphal. Inaccessible, high altitude bogs on some of the plateaus caused by the high rainfall. Legendary menehune, shy builders pushed into the mountains by the arriving polynesians. Nounou, the sleeping giant, who guards Waialeale Crater, from the top of which Hawaiian priests used to throw down offerings once a year. Though perhaps too tropical for a Japanese themed locale? where is a good location for "Spirit Island"? Do you want a real island, or a legendary one? If the latter solution is OK, I would suggest Fusō (扶桑, Chinese pronunciation: Fúsāng). Fusō is supposed to lie somewhere east of Japan. A great book for folktales is Japanese Tales by Royall Tyler. It's largely sourced from Heian-era works, but that rawer, simpler spirituality would fit a remote island well. If you want themed monsters for the dungeons, then kappa for water, tengu for air, and a hi-no-tori (Phoenix) for fire are obvious. Do you know about the five guardian beasts of the elements? I've worked them into numerous campaigns in the past, where they usually have a surprising resemblance to Godzilla, Rodan, Mechagodzilla, Gamera, and Ghidorah. The Gamera=Genbu angle is explicitly referenced in the '90s Gamera films -- "Gamera 3: The Revenge of Iris," especially. Those are super cool. Don't know how I'll use them yet, but I'll have to work them in. Royall Tyler's book is on my list, and luckily enough, even the local library has it. I'll be starting that one shortly. Historical books like Tale of the Heiki, or Genji, are on the list too, but may not help with the bestiary right away. DAMMIT!!! Byakko is West! How do I keep mistyping this stuff?! Very cool stuff, really great idea for a campaign!